The warming climate has resulted in an increased impact on urban heat islands – built-up areas where buildings, roofs and paved surfaces temperatures can be hotter than the air itself. Known as the heat island effect, this retained and radiated heat causes overall night temperatures to rise higher than in neighboring, less developed areas. Urban heat islands not only escalate the absorption and emittance of heat back into the atmosphere, the use of mechanical systems for cooling also triggers a rise in environmental pollutants, thereby causing additional burden on the environment. Pavements are a big contributor to urban heat island effects. How can we make them better? We work with government and industry partners to develop new designs and evaluate technologies that include modified pavement systems that better maintain safe and durable highways. We do this while keeping sustainability in mind – considering the important environmental, social and economic issues. Our research on rubberized pavements and fiber-reinforced asphalt concrete has shown that these modified materials are durable and resilient. They offer better overall performance, which translates into road-user benefits, including improved ride quality, less fuel consumption, lower maintenance frequencies and safer roadways. These pavements also offer the advantage of reduced pavement thickness, which in turn reduces use of natural resources and curtails greenhouse gas emissions. We also work with permeable pavements – pavements that allow movement of storm water through the surface – which can mitigate urban heat island effect by dissipating heat more quickly than dense pavements. The improved water flow also has a positive effect on storm water management, and cooling pavement surface temperature. We’re working with local governments on the potential benefits of recycling old asphalt pavements. 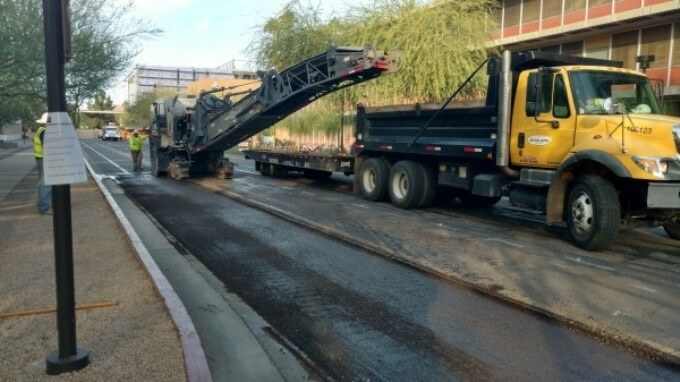 Although the national trends in recycling asphalt pavements are encouraging, the environmental conditions in Phoenix are extreme and need further consideration. Generally, we have found that the use of recycled asphalt pavements at moderate percentages can lead to greater resource conservation and more environmentally friendly approach to paving. What are the biggest future challenges with regard to our transportation infrastructure? The International Disaster Database shows that extreme weather events have been increasing over the decades. To prepare for future climate-precipitated events, we need to invest in upgrading our severely distressed infrastructures while re-evaluating our current designs and specifications, looking at solutions that improve the performance of various transportation elements under extreme weather conditions. At the same time, as extreme weather events and the pressure of growing traffic demand continue, we will face increasing challenges to sustain and balance durability, user safety and effective mobility, and sustainability. Developing and installing sustainable pavements and other building materials will be critical to creating a sustainable future not only for our transportation infrastructure, but also for highly populated urban areas.